Size: 5.5" x 2.8" x 0.45"
Production of the original TI-30 SLR+ was shifted in 198 from China to Italy. The pictured unit owned by a former employee of Texas Instruments (Germany) seems to be an early prototype. 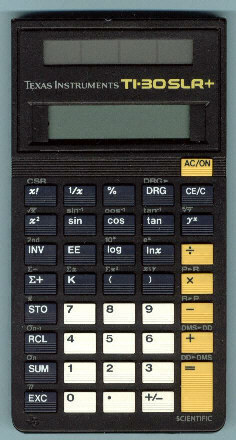 Please notice the changes of the display frame to the TI-30 SLR+ available in the stores in 1988.